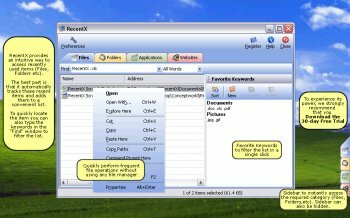 RecentX gives super-fast access to your widespread documents & deep folders without navigating complex, often annoying and time-consuming hard drive directories. Without any configuration or system scanning, RecentX automatically tracks the files, folders, programs & websites you use. It keeps them accessible in an easy-to-use and easy-to-find format. RecentX can remember recent items that are several months old. Download free trial to experience its benefits right away.